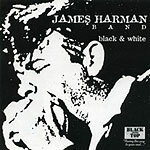 CD review: "Black & White"
This may be perennial SoCal blues favorite James Harman's best recording yet. Certainly, its stripped-down sound is the rawest he's recorded. The songs  all originals  are among his strongest, and his band is as tight as it's ever been. But it's the nerve-jangling rawness he achieves in his sound that will keep "Black & White" in the CD player for an extended stay. Harman's singing and harmonica playing dip into a deep emotional well that will scorch your soul. His West coast brand of blues has always combined a deeply swinging approach with the instrumental virtuosity of the Chicago school, but on this album both these strengths are secondary to the overriding passion of the performance.